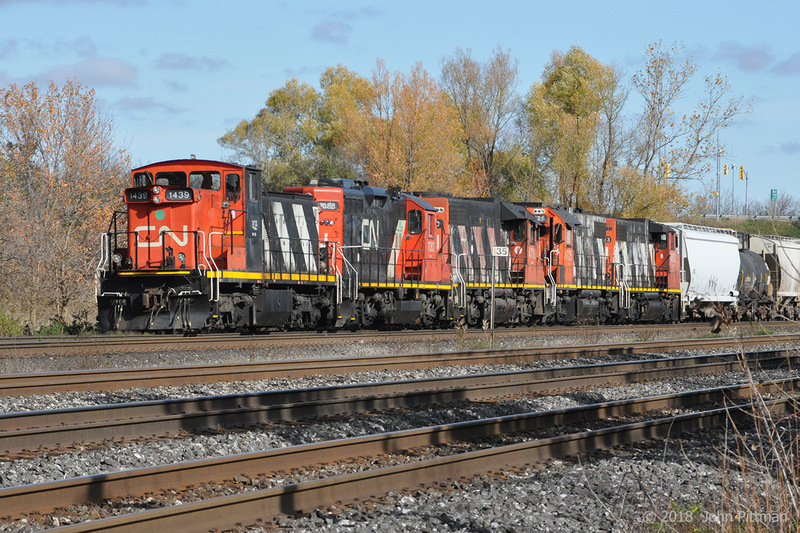 Railpictures.ca - John Pittman Photo: CN 1439 is in control of a set of 5 locomotives switching cars at the west end of Aldershot Yard. GM locomotive types GMD1, GP9rm, GP38-2,GP38-2, GP38-2W. CN 1439 was operated with the engineer seated on the far side, short hood forward. The engines were halted beside Oakville Sub MP 35. As well as better bi-directional view, a GMD1 might be less fatiguing to ride – the lower powered diesel could have less torque reaction and vibration (compared to a GP38 that I rode in once). | Railpictures.ca – Canadian Railway Photography – photographie ferroviaire Canadienne. Caption: CN 1439 is in control of a set of 5 locomotives switching cars at the west end of Aldershot Yard. GM locomotive types GMD1, GP9rm, GP38-2,GP38-2, GP38-2W. CN 1439 was operated with the engineer seated on the far side, short hood forward. The engines were halted beside Oakville Sub MP 35. As well as better bi-directional view, a GMD1 might be less fatiguing to ride - the lower powered diesel could have less torque reaction and vibration (compared to a GP38 that I rode in once). I second the rough ride comment about the GMD1′s, there is not as much vibration as a standard GP9 or GP38, but they are an extremely violent ride, 15mph on track that is even slightly uneven is a white knuckle adventure. We currently have 3 of them in Sarnia and they can be downright terrifying on yard tracks. The light weight, coupled with a high centre of gravity and exceptionally tall seating in the cab really exaggerates any movement. They are great pullers though, for their light weight they grip the rail well, they load quick and don’t give up easy. My foamy side still loves them. I’d like to thank all the people who favourite my images and comment. Encouragement is much appreciated. It takes time and effort to submit an image, but not all get accepted. Clicking on the railpictures.ca Photographer name below the caption is an easy way to find more of their images. Great Catch! There was a time when I thought that CN was giving up on these GMD1s. I’m Glad to see they are back in service and running the rails as only they can. I wonder, how do these GMD1s compare to a GP9 in terms of reliability and economy for there must be a good reason why CN is still hanging on to them for so long. Again, Great catch and THANKS FOR SHARING! Actually the view from the GMD1 is not that great especially when riding with the short hood leading compared to an SW1200RS or conventional cab unit. As for the ride, it is rough and you feel all the bumps and uneven trackage because it its lighter weight. But glad these beauties are still working on a Class 1 in 2018! !